See Paris and die. Even better - see the raising of the drawbridges across the Neva River and then move to St. Petersburg! One of the city's most recognizable symbols – Troitsky Most (Trinity Bridge) celebrates its 120th birthday. Trinity Bridge connects Suvorov Square and Palace Embankment on one side of the Neva River, with Trinity Square on the other side, not far from the Peter and Paul Fortress. The city’s very first bridge was built close to this spot in 1803, which was originally a temporary pontoon bridge with a horse-drawn rail car that led to the Summer Gardens. About two decades later, the first permanent bridge was built, but this time it led to the Suvorov Square, which is about 100 meters west of the Summer Gardens. Finally, in 1903 Trinity Bridge was opened to the public. The 1803 bridge was called the Voskresensky Bridge, and after reconstruction in 1827 it was renamed the Suvorovsky Bridge in honor of the great Russian general. In 1903, the bridge was named Trinity to honor the nearby Trinity Cathedral on Trinity Square. After the 1917 Revolution, the Soviets renamed it the Bridge of Equality, and in 1931, when the Trinity Cathedral was destroyed, it made sense to change the bridge's name. An opportunity came in 1934 following the murder of Sergei Kirov, head of the Leningrad Communist Party. Kirov Bridge held sway until the communist authorities were overthrown in 1991, and amidst a patriotic and religious upswing, the name of Trinity was returned. In the late 19th century, city authorities decided to build a grand and impressive bridge, and held a competition. Though first prize went to Gustave Eiffel's company, the engineers were selected from another French company, Batignolles. According to the agreement, they had to use only Russian materials and Russian workers. St. Petersburg architects also played an active role, and the Academy of Arts even created a commission to monitor construction. French designers, however, prepared ornamentation for the bridge - grids and lanterns in the Art Nouveau style. The bridge was also decorated with two rostral columns. Construction of the Trinity Bridge began on Aug. 12, 1897 in the presence of Emperor Nicholas II and French President Félix Faure. Just a year earlier, Nicholas II opened the Alexander III Bridge in Paris, which was dedicated to his father. The completion of the Trinity Bridge was delayed due to technical problems and opened only in 1903, coinciding with the 200th anniversary of St. Petersburg. There is an archival photo showing the city head giving the Emperor a button that he then pressed to raise the drawbridge. In 1965, the bridge was closed for reconstruction, and Soviet engineers spent two years modernizing and reconstructing the bridge in order to accommodate navigation of modern ships. A new lifting mechanism was installed, and the double span system was changed to a single one. The bridge re-opened in 1967. By the way, until 1965, when the 905-meter-long Alexander Nevsky Bridge was built, Trinity was the city's longest bridge at 582 meters. Bonus: Local legend says that the great Soviet aviator, Valery Chkalov, flew his plan right under the Trinity Bridge some time in the 1930s. No one knows exactly when, but this legend is quite persistent, especially because his widow insists it did happen. 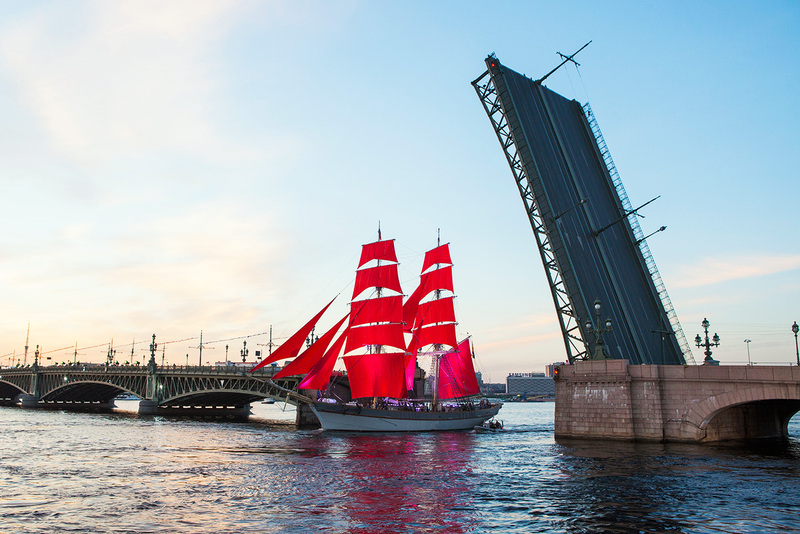 Elena Bobrova, a St. Petersburg guide said, "I always recommend tourists to watch the raising of the Trinity Bridge. First, because every guest to St. Petersburg should at least once see the raising of the bridges, and second, Trinity is so exquisite and elegant! While there are crowds around the Palace Bridge and most bridges across the Neva rise in the middle, the Trinity rises high in front of your eyes, if you're standing on the Palace Embankment. Another must-see view is from the eternal flame on Marsovo Pole"